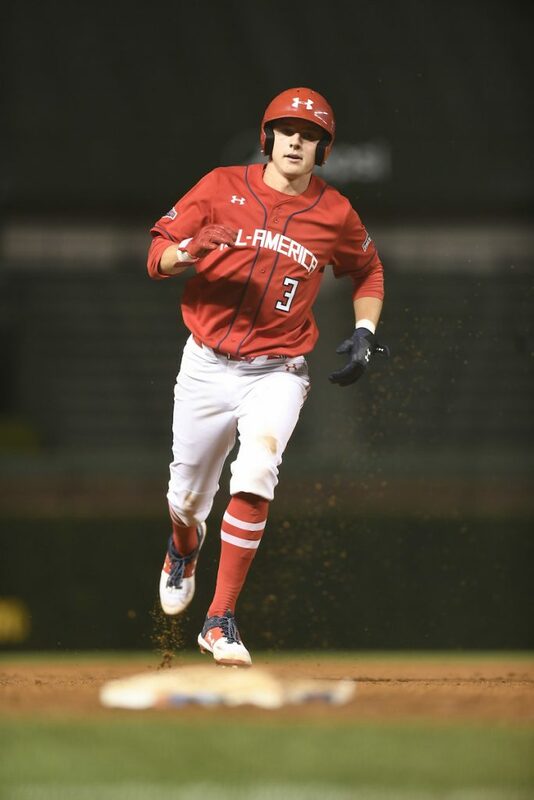 En route to victory over the National team in this year’s Under Armour All-America Game, this group of position players put together eight runs on eight hits against just eight strikeouts. They were issued 11 free bases, nine via the walk and two were hit by a pitch. 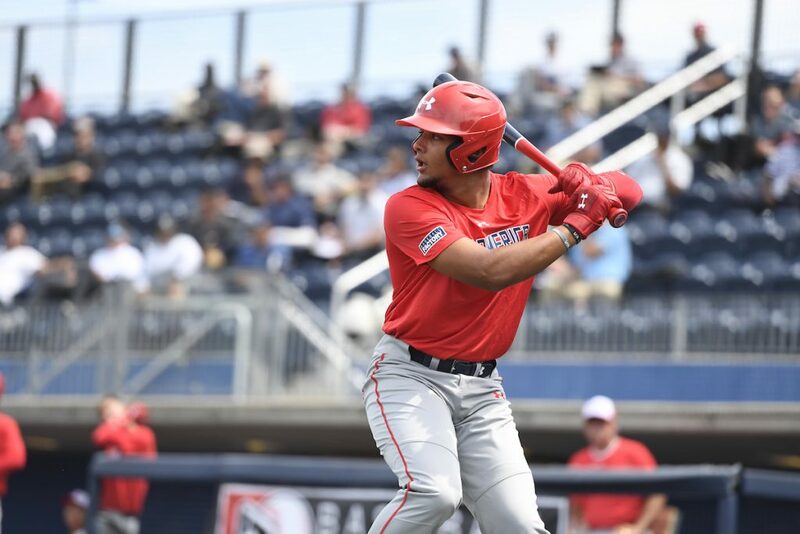 Let’s take a look at the American team position by position with scouting report write-ups coming from Baseball Factory scout, Andy Ferguson and Baseball Factory’s Executive Vice President, Steve Bernhardt. 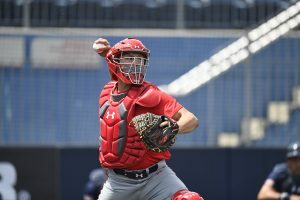 Perry showed the best arm of any of the catchers during the workout on Thursday afternoon, at least on my card. The ball left his hand with easy life and he drove his throws down and through the bag with release times between 1.85 and 1.92. The thing that stands out the most about him offensively is how easy his swing looks. He has a large frame at 6-foot-2 and 220 pounds, and made a short and direct move to contact. He clearly has the strength and ability to impact the ball for raw power, though it looks like he is simply serving line drives from gap to gap. Hearn is a talented offensive player at a premium position. 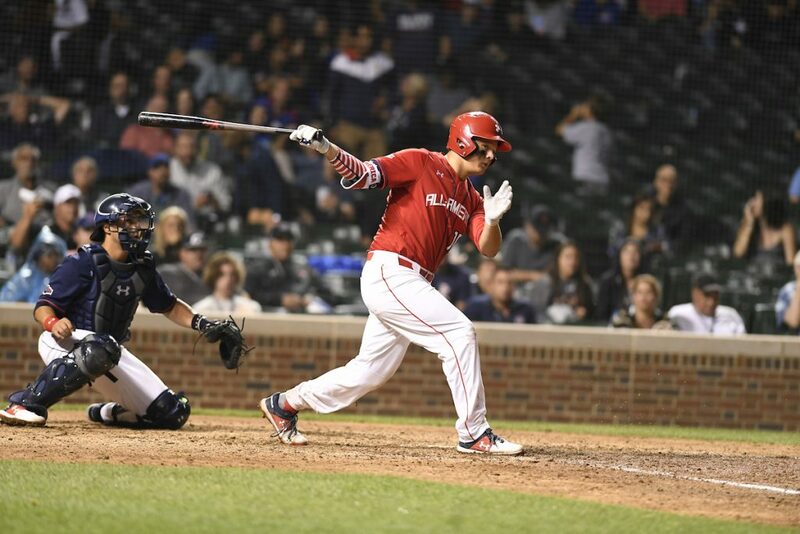 His left-handed stroke features a combination of rhythm, balance and strength that allows for consistent barrel contact and big raw power – as we saw during the home run derby semi-finals, where he posted 7 home runs in two minutes. Behind the plate, he is a solid receiver with a big arm. His workout pop times were 1.82 to 1.95 on my watch, with room to clean up his exchange to allow for a more consistent release. 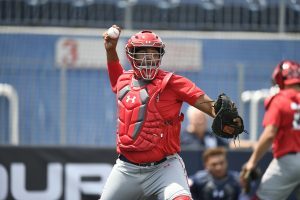 He plays the game behind the plate much better his actions appear defensively during a workout, thanks to a high energy and competitive approach. Among position players, Austin is one of the easiest to dream on. 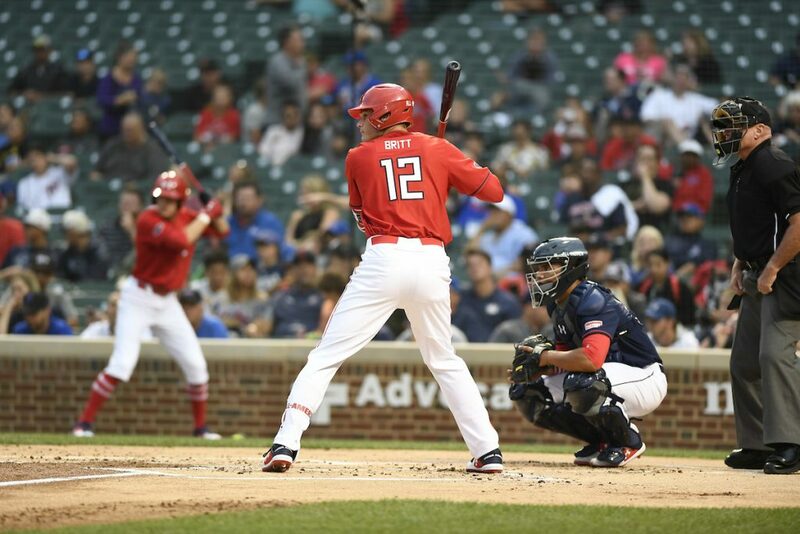 He’s a long and high-waisted 6-foot-3 and 180 pounds, and used his leverage for impressive streaks of easy power – most notably in the home run derby semi-finals, where he posted seven home runs to tie for second place on the American team. As he gains strength and body control, he should also gain consistency in his ability to deliver the barrel to contact. Defensively, he’s got life to his actions along with plenty of arm strength, but his overall length seems best suited for a move over to third base in the future. Henderson is another projectable hitter, yet in a different way than Myles Austin. Where Austin is explosive but somewhat inconsistent, Henderson has the pieces in place for consistency but needs time to grow into his 6-foot-2 190 pound frame. His left-handed stroke is fluid and natural with a direct path to contact, with more hit than power at present. Gains in strength and experience will see him increase his ability to impact the ball. 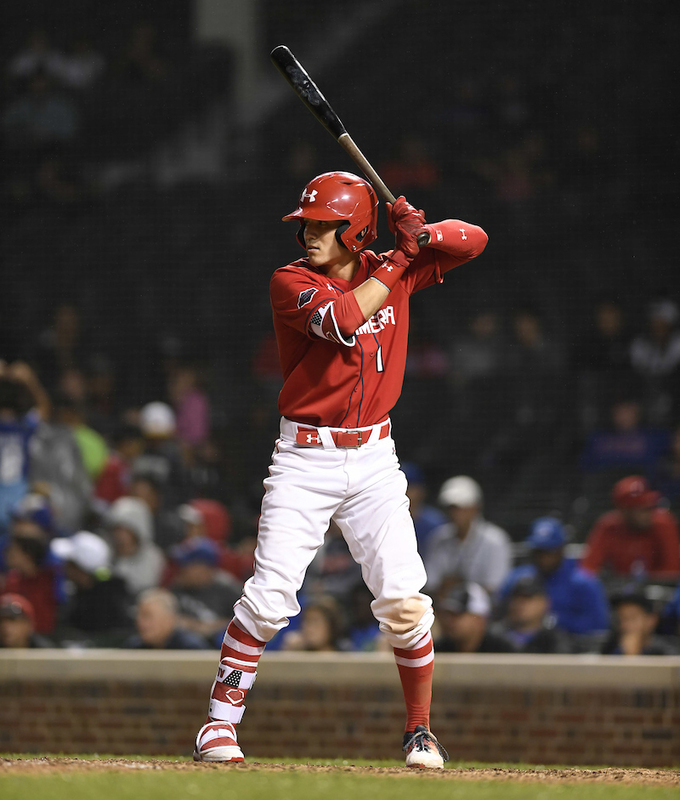 He’s a quality athlete with the versatility to play every infield spot, but based on his ability to carry throws across the infield and his projectable future size he projects best at 3B. You’d have to do some serious nitpicking to find something not to like about Volpe. He has an advanced feel for the game, plays under control and plays fast – all hallmarks of the “baseball player” type. His right-handed stroke is simple and coordinated, allowing for consistent barrel contact. In two at bats, he lined a 94 mph fastball at the second baseman, and made a nice pass at at 92 mph fastball for a fly out to deep center field. Defensively, he has quick feet and sure hands to go with a quick release, allowing him to play both sides of the bag. 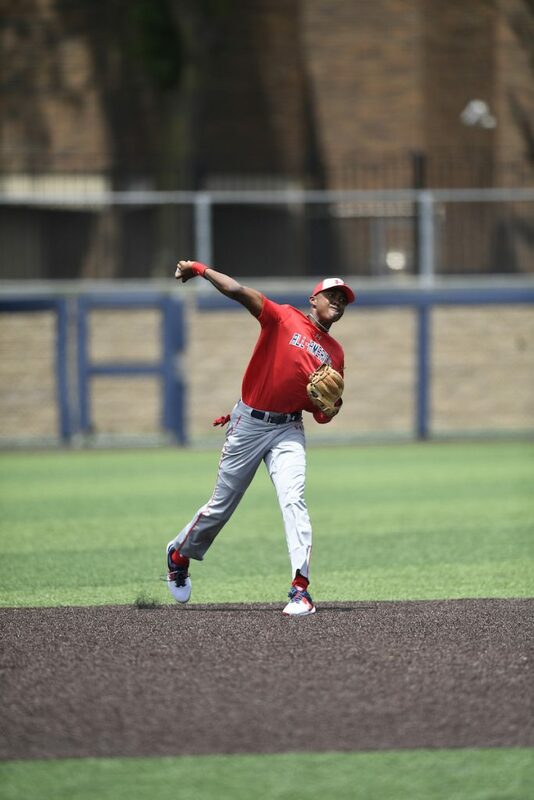 He’s committed to Vanderbilt, and it would be no surprise at all to see him as a key piece of another run to the College World Series for the Commodores. Among the best hitters in the 2019 class, Callihan’s left-handed stroke is built on bat speed and strength in his hands and forearms. He made consistent loud contact during batting practice, and then put on a raw power display in the home run derby semi-finals. He posted 8 home runs to advance to the finals for the American team, only to be outdone by Rece Hinds in walk off fashion. He came up empty in four trips to the plate in Chicago, but he’s a proven game power producer. Defensively, he played both corner infield positions. He’s got body control and a feel to make throws more than he has pure arm strength, along with solid feet and hands to handle the hot corner. Normally we see players with either huge tools or exceptionally usable tools – not both. That’s simply not the case with Bobby Witt, Jr. – he has both. He isn’t an overly physical presence at 6-foot-1 and 185 pounds, but he has as much raw power as anyone in the 2019 class aside from Rece Hinds. Obviously that’s a result of strength and bat speed, but I also think it’s largely because he hits such a high percentage of balls right out of the sweet spot – it’s such a consistent swing, there just isn’t much that can go wrong. Though he didn’t advance to the home run derby finals, he did turn in the most impressive game at bat. 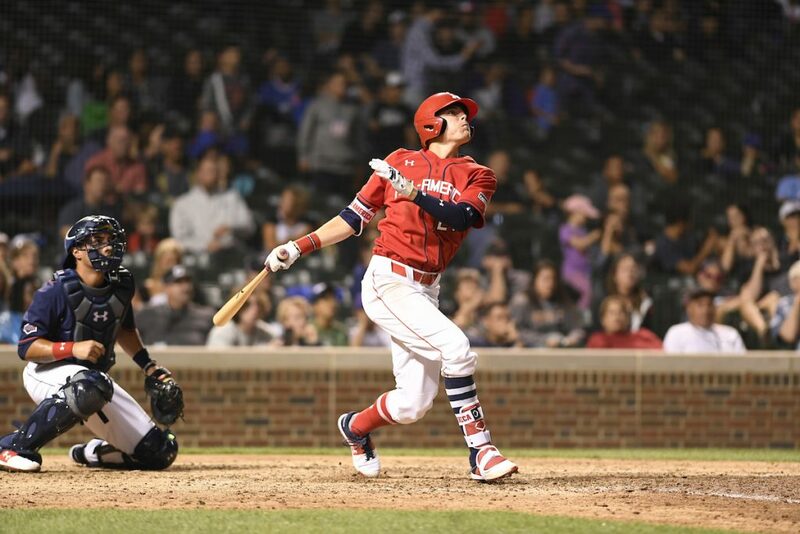 He spoiled everything Derek Diamond threw at him multiple times before blasting a two-strike breaking ball almost onto Waveland Avenue for a ninth inning 3-run HR to break the game wide open. Defensively he features fluid and easy actions along with advanced body control and overall feel for the game. He’s got a plus arm in reserve for when he needs it. Carroll is a dynamic offensive player, with a knack for making things happen that impact the game. In his second at bat at Wrigley he doubled to right field on a 93 mph fastball, stole third and then scored the first run of the game. After walking in the eighth inning, he singled the other way to join a group of three others with a multiple hit day. His left-handed stroke is balanced and compact, and he has surprising power. While the BP is impressive, to truly appreciate him you must watch him play the game. Britt is a physical specimen at 6-foot-5 and 210 pounds with length to his levers and room to fill out. We’ve seen big arm strength from the outfield along with 6.5 speed in the 60 yard dash and 100 mph exit velocity. Obviously, he’s a very naturally gifted talent, and when he puts it all together he is very impressive to watch. Such was the case during his second round of BP on workout day, where he drove balls out of the ballpark from left center field over to just near the batters eye with relative ease. Tarver was another among the group to collect multiple hits, and he was the only player to score twice. A left-handed hitter, Tarver doubled the other way on a curveball from a left-handed pitcher, and later singled the other way on a right-handed breaking ball. 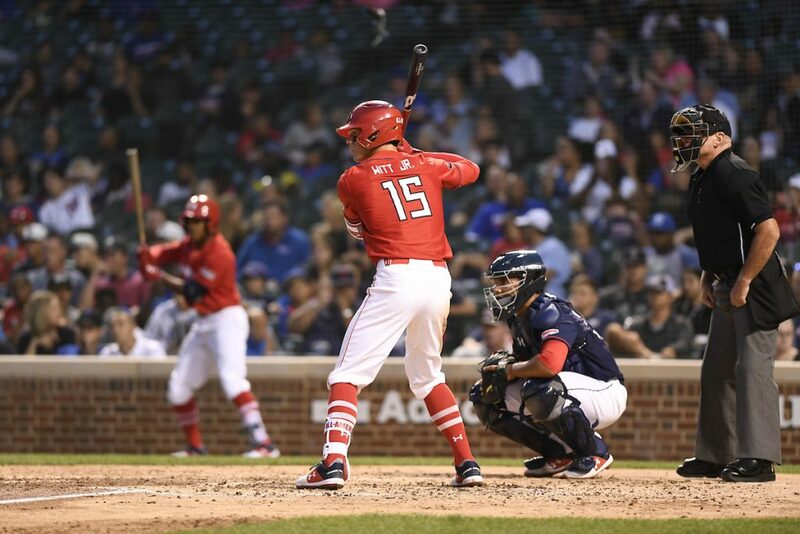 As he showed in the game, he’s got a knack for getting the barrel to the ball, and his stroke is compact and strong through the zone with great extension – allowing him to hit the ball to all fields solidly. 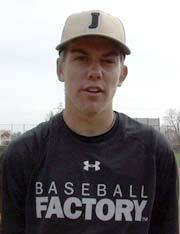 He fits a corner outfield profile defensively, and has strength on his 6-foot-2 210 pound frame. Newell stands a projectable 6-foot-2 and 190 pound with length and width to his frame. He was cleared to throw just prior to this event, and went on to show the best outfield arm on the American team on my card. His throws carried on line from a over top slot. In BP he didn’t make the most consistent contact, but he was able to carry the ball a long way with natural lift to his flowing left-handed stroke. His game at bats appeared to feature a looser and more natural stroke. He lined out to second base on a 98 mph fastball, flew out to deep right field on a 79 mph left-handed breaking ball and hit a sharp grounder at the first baseman on a 69 mph right-handed breaking ball. A selection for the Under Armour All America Football Game as a running back, Ealy is among the fastest runners in the 2019 class of baseball players. He is built solid and strong at 5-foot-10 and 190 pounds, and oozes quick twitch and strength throughout his tools. His right-handed stroke is short and compact, and he impacts the ball for easy raw power when his timing is on. 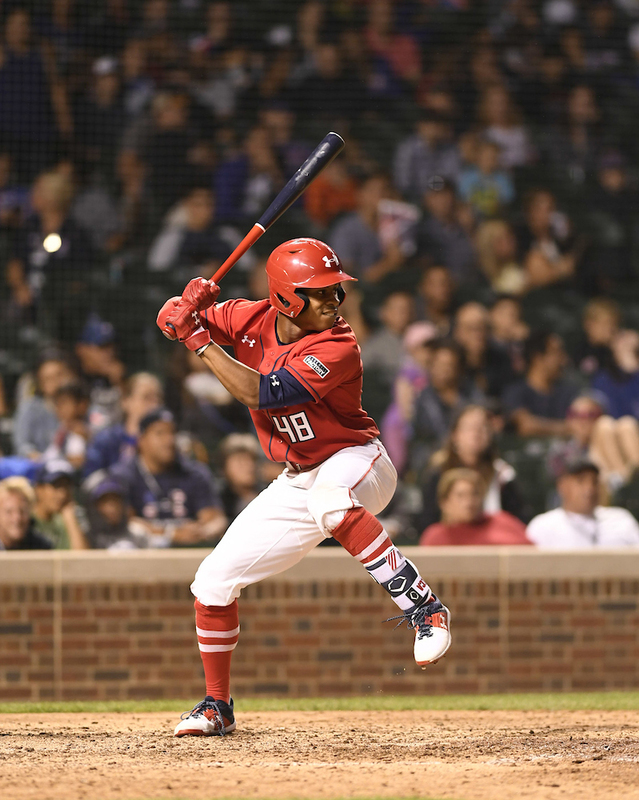 As is often the case with multi-sport athletes, Ealy is somewhat raw and would almost certainly ramp up his consistency if he were to ever focus on baseball. His defensively ability could fit at any outfield spot – he’s got the speed and range for center field, and the arm strength for right field.